The Yesterday, Today and Tomorrow plant is a shrub or small tree that blossoms late into the season. A native to the Brazilian rainforests, this plant enjoys warmer climates in zones 9, 10 and 11, or can be grown in cooler zones in containers to be brought indoors when frost threatens. 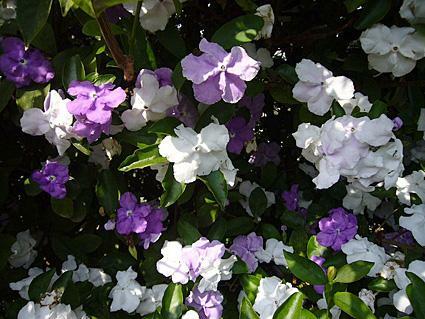 The Yesterday, Today and Tomorrow plant, or Brunfelsia latifolia, got its more common name because of its fragrant two-inch blooms. These flowers last for three days and change color with each day. The first day they are purple (yesterday), the second day they change to a pastel lavender shade (today), and on the third day they change to an almost white color (tomorrow). Because each flower lasts for three days and goes through this colorful transformation, it is easy to tell whether it is a yesterday bloom or a shade representing today and tomorrow. This unique plant creates variegated clusters of color and breathtaking beauty when all three shades are present. Unlike some plants that flower for two to four weeks, one thing that makes these shrubs so desirable is that flowering starts in the summer and promises plenty of yesterdays, todays and tomorrows as flowering lasts into September and October. While these flowers are pretty, offer months of blooms and give off a sweet-smelling fragrance, it is important to note that these plants also contain poisonous alkaloids and may not be the best choice for households with young children. Seeds from the flowers are poisonous and berries from the Yesterday, Today and Tomorrow plants are especially toxic. To avoid accidental poisoning, caution should be taken and extra safety measures put into place such as adult supervision when toddlers, young children or pets are playing outdoors. In all, there are approximately 40 species in the Brunfelsia genus. While these tropical perennials do well in warmer climates, they do not enjoy extreme heat, and grow best in tropical climates in areas with partial shade. They make an ideal choice as a garden shrub in milder climates while varieties that grow in zone 8 and up are more like small evergreen trees that don't lose their green leaves (three to seven feet tall). They do best in slightly acidic soil, and as natives to the Brazilian rainforest, they should be watered well, soaking the soil and then letting the soil dry out before watering again. If you live in a cooler climate, the Yesterday, Today and Tomorrow plant can be successfully grown in containers ideal for a patio or entryway. This way they can be brought indoors when the weather turns too cold or frost threatens. Growing these plants in containers will keep them smaller and requires some pruning. However, they will still produce prolific fragrant blooms from summer into fall. These evergreen shrubs make a popular choice when landscaping your garden. Not only do they provide fragrance and long-lasting blooms, but when paired with complementary low-growing flowers the evergreen foliage from the Yesterday, Today and Tomorrow provides a perfect backdrop to make the color of your other flowers pop. For complementary flowers, choose varieties that bloom in spring and summer to create a garden that bursts with color for most of the year.